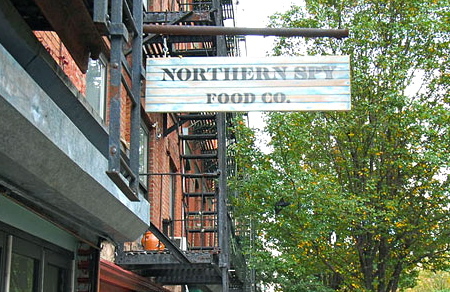 Northern Spy Food Co. is a true local and sustainable gem in NYC. Named after one of New York State's classic heirloom apples, this restaurant- a small, unassuming space nestled on a quiet tree-lined East Village block- centers its menu around seasonal and quality, local ingredients. Only two years old, the restaurant's interior space is built with repurposed materials: the wall paneling is derived from lumber yard leftovers; the retail cubbies were chicken coops in their former lives. I've been fortunate to have the experience of dining at Northern Spy, and was thus thrilled when I discovered that Chef Nathan Foot had posted his famous Northern Spy Food Co. Kale Salad recipe online via TastingTable. I ordered this dish for brunch one day-yes, topped with two poached eggs please!-and could not stop raving about this delightfully fresh crunchy salad. At the time, I was convinced that some type of magical secret ingredient dominated this gustatory treat. However, after reading the ingredient list, I was surprised to find that the only secret to this spectacular salad was a fresh local batch of black or Tuscan kale. 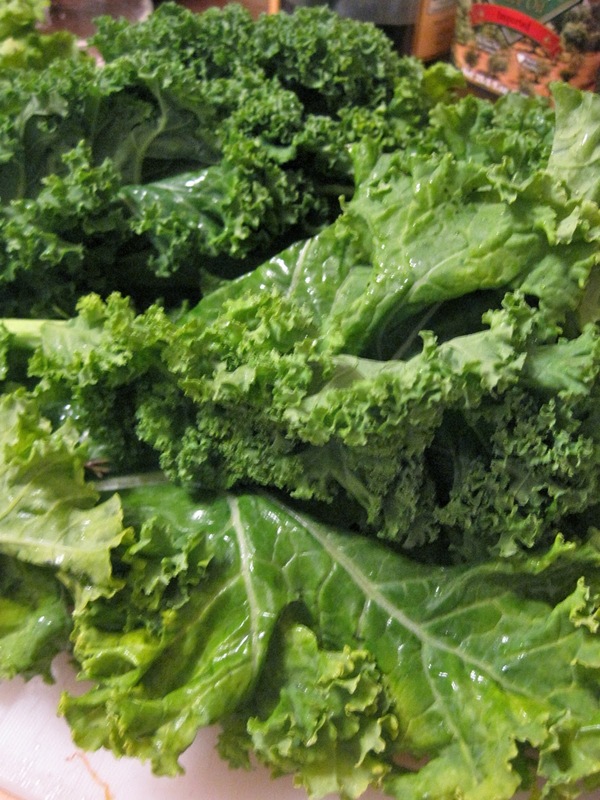 Tossed generously with olive oil, lemon juice, salt & pepper, the kale positively shines. Foot also adds cheddar and Pecorino cheese, toasted almonds and butternut squash to the mix. An optional poached egg adds some protein to the salad repurposes the dish for a brunch time meal. 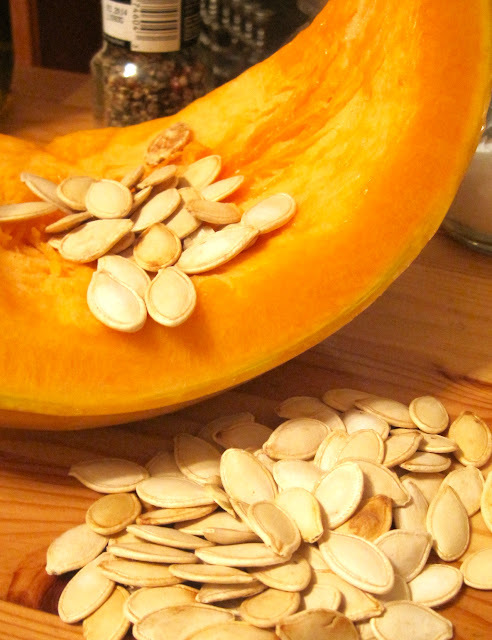 As I have been kvelling over pumpkin lately, I decided to substitute the roasted butternut squash with some roasted cheese pumpkin and its interior toasted seeds. 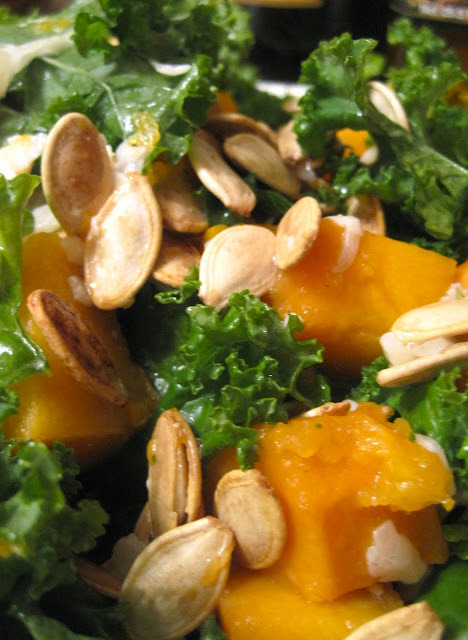 Adding pumpkin to salads was something I discovered while living in Australia; a rocket, roast pumpkin and Parmesean salad down under is as easy to find as a Cesear salad here in the United States. Note that some of the ingredients do not have exact quantities; the reasoning is that this salad should really be seasoned to taste. Prep immediately before eating for maximum freshness. Enjoy! 1. In a large mixing bowl, toss the kale with the almonds, cheddar squash/pumpkin, and pumpkin seeds (if desired). Season to taste with lemon juice and olive oil (approximately 1 tablespoon lemon juice and 2 tablespoons olive oil). Season to taste with salt and pepper. 2. Divide salad between two plates or shallow bowls. Garnish shaved pecorino cheese, if desired, and serve.